doi:10.4236/jbise.2011.44040 Published Online April 2011 (http://www.SciRP.org/journal/jbise/). 2ECE Department, Wayne State University, Detroit, USA. 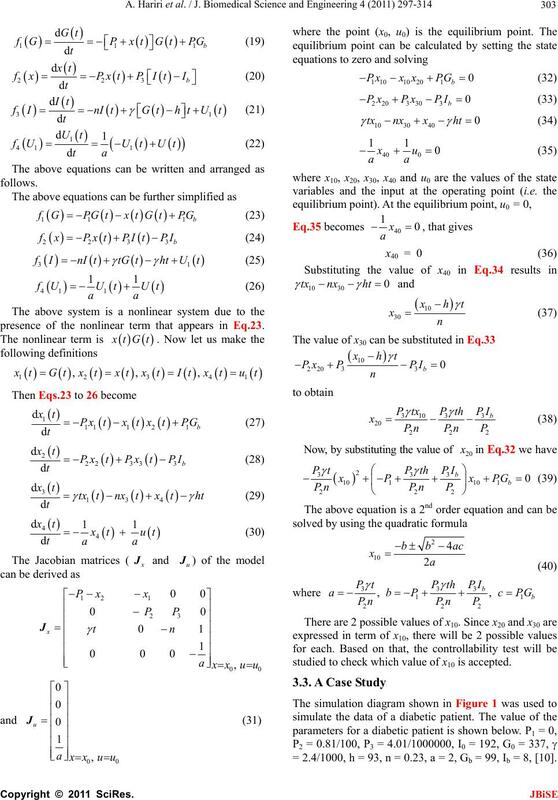 Received 3 June 2010; revised 19 June 2010; accepted 21 June 2010.
of three differential equations with unknown parameters. 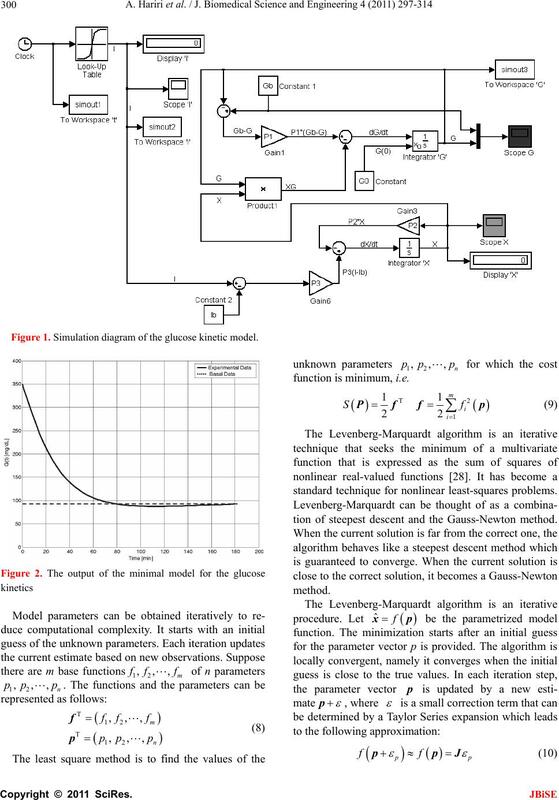 Model under a given operating condition. basal level, glucose enters the glucose compartment. amount inside the interstitial insulin compartment. 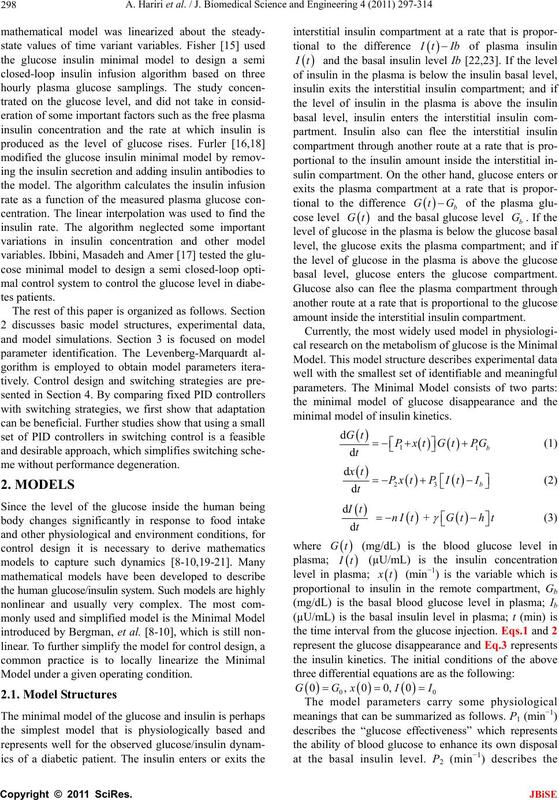 minimal model of insulin kinetics. command, and a is the time constant of the pump. Table 1. FSIGT test data for a normal individual. P3 = 1.062 × 10–5, G0 = 350, Gb = 92, Ib = 11, [8-10]. estimated to yield a least squares error. Figure 1. 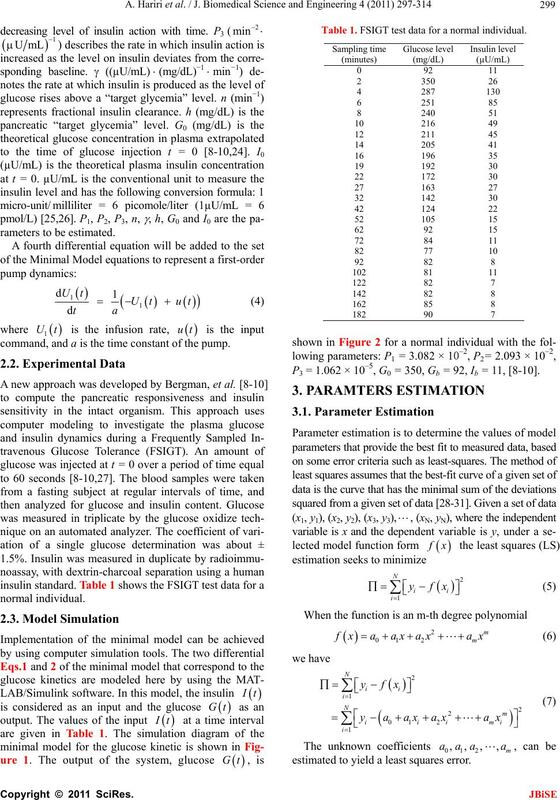 Simulation diagram of the glucose kinetic model. 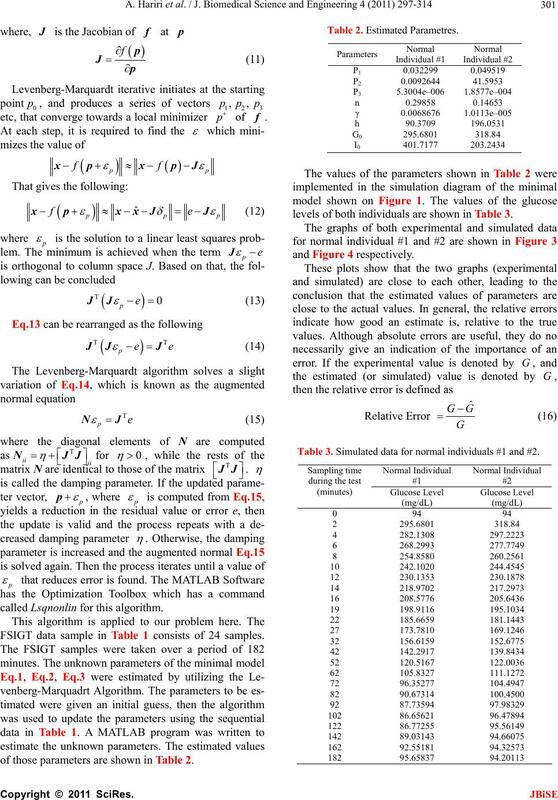 standard technique for nonlinear least-squares problems. 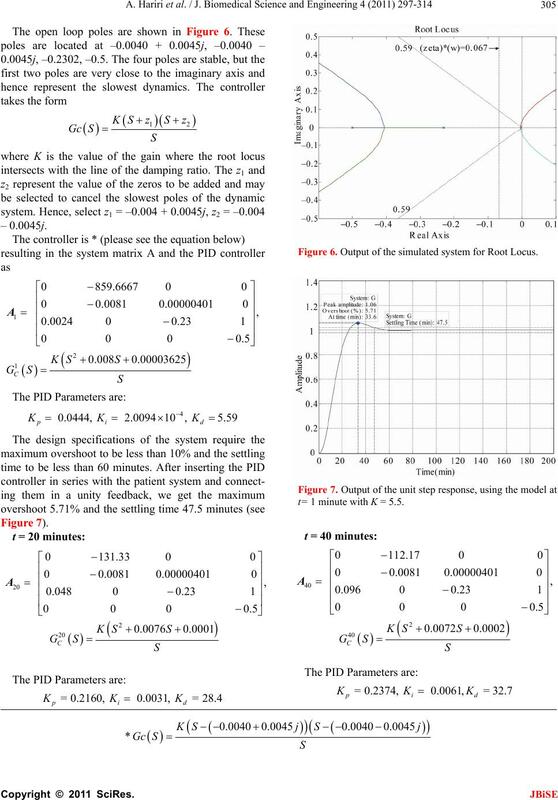 tion of steepest descent and the Gauss-Newton method. called Lsqnonlin for this algorithm. FSIGT data sample in Table 1 consists of 24 samples. of those parameters are shown in Table 2.
levels of both individuals are shown in Table 3. Table 3. Simulated data for normal individuals #1 and #2. Figure 3. 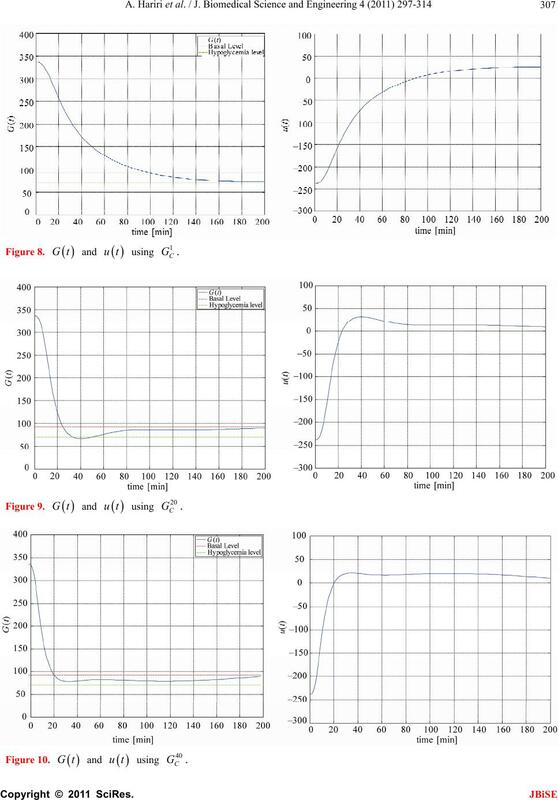 Plot of glucose level G(t) for normal individual #1. Figure 4. 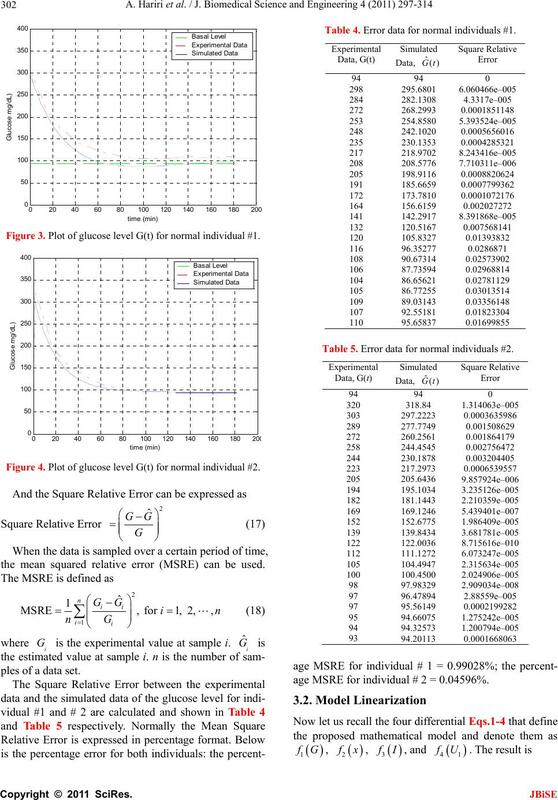 Plot of glucose level G(t) for normal individual #2.
the mean squared relative error (MSRE) can be used. ples of a data set. Table 4. Error data for normal individuals #1. Table 5. Error data for normal individuals #2.
age MSRE for individual # 2 = 0.04596%. presence of the nonlinear term that appears in Eq.23. studied to check which value of x10 is accepted. = 2.4/1000, h = 93, n = 0.23, a = 2, Gb = 99, Ib = 8, . The output of the simulated system is shown in Figure 5.
neighborhood of the normal level. Figure 5. 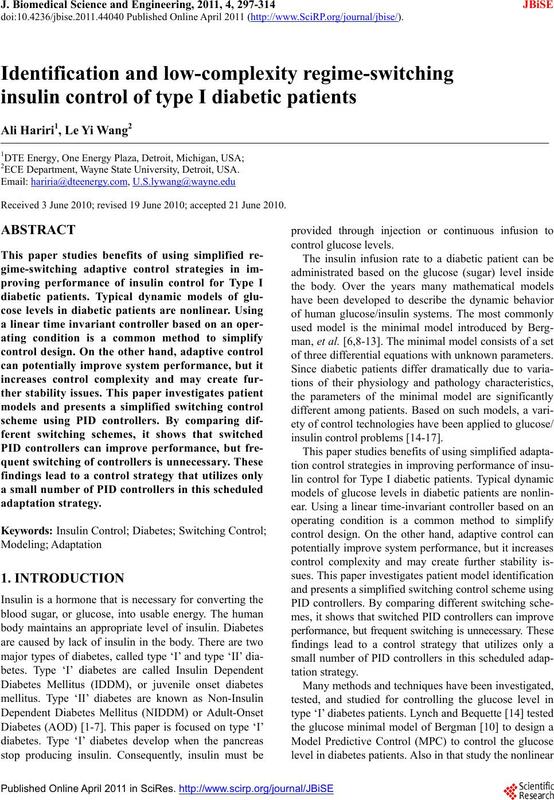 Output of the simulated system for diabetic. where u is the input and y is the output of the system. this value is used in the subsequent development. time less than 60 minutes. must be greater than 0.067. 182 minutes, and the corresponding PID controllers. method and then evaluated by using the step response. Figure 6. 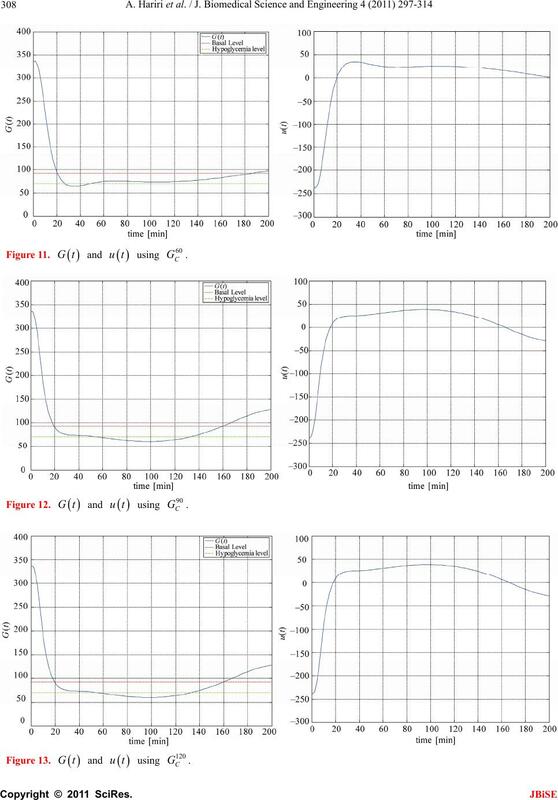 Output of the simulated system for Root Locus. t= 1 minute with K = 5.5.
shown below in Figur es 8-15.
close to where it should be as per the design requirement. detail in the following section. gram of the Control-Switching Scheme. Figure 16. 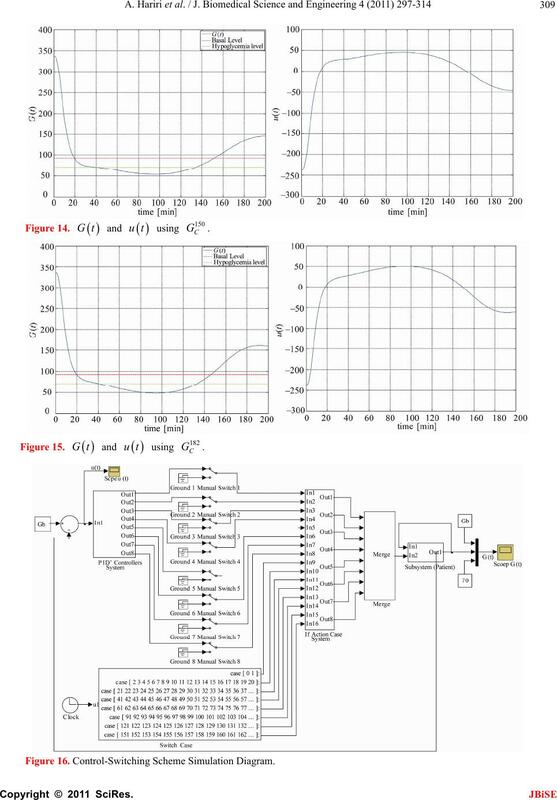 Control-Switching Scheme Simulation Diagram. 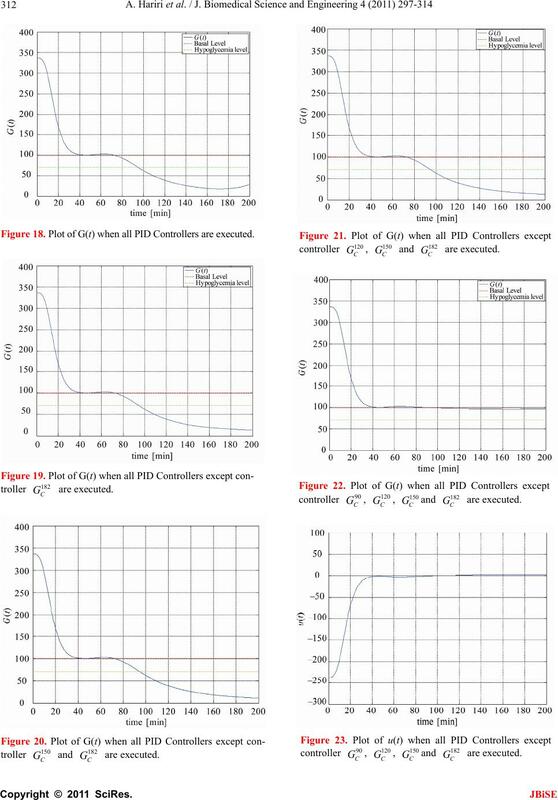 time interval zones as shown in Table 6.
the PID controllers OFF or ON. tween the eight time zones that were specified in Table 6.
status of the “If-Action Case”. Table 6. Swithing Time Interval. 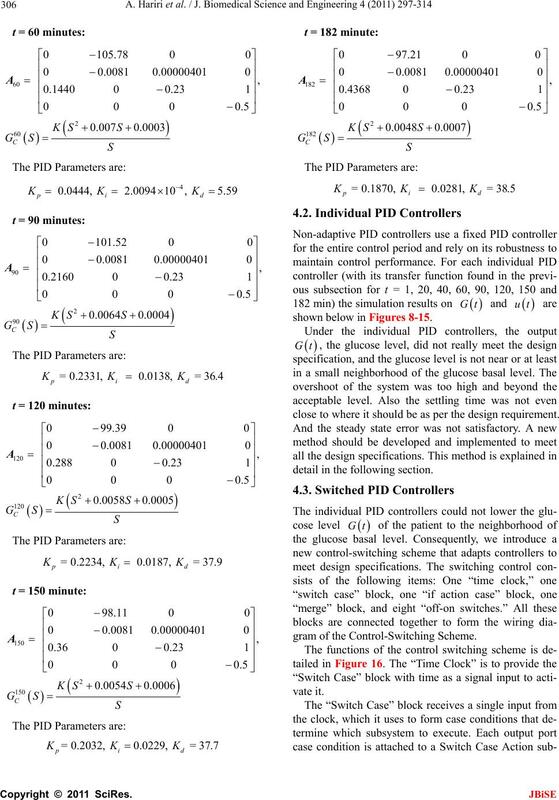 Gt of the system, shown in Figure 22,.
of the PID Controller system is shown in Figure 23. 154, n = 0.22, a = 2, Gb = 100, Ib = 8, . Figure 17. 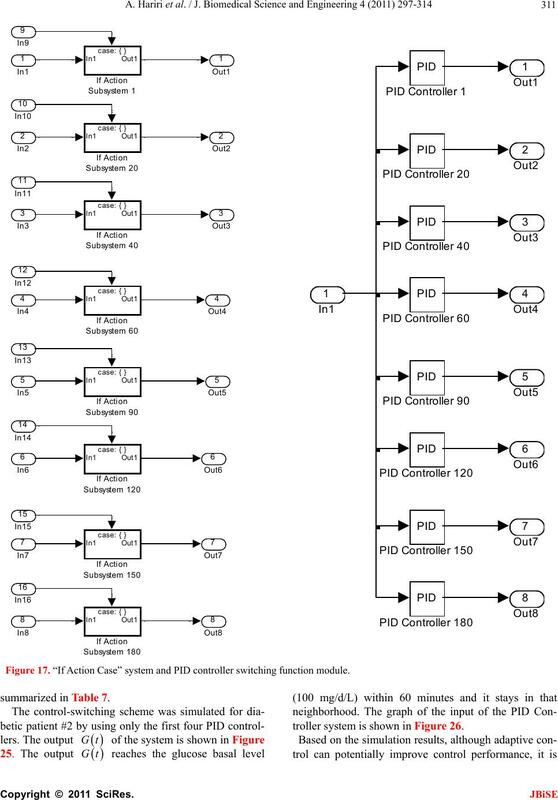 “If Action Case” system and PID controller switching function module. troller system is shown in Figure 26. Figure 18. 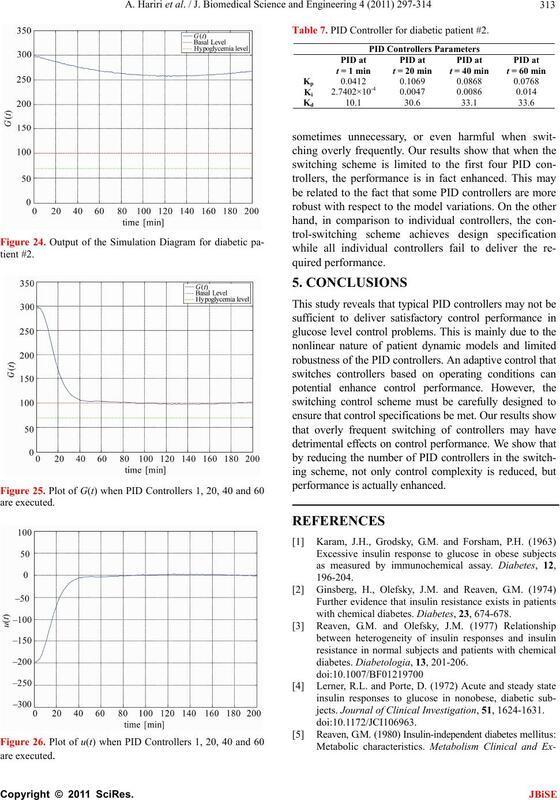 Plot of G(t) when all PID Controllers are executed. Table 7. 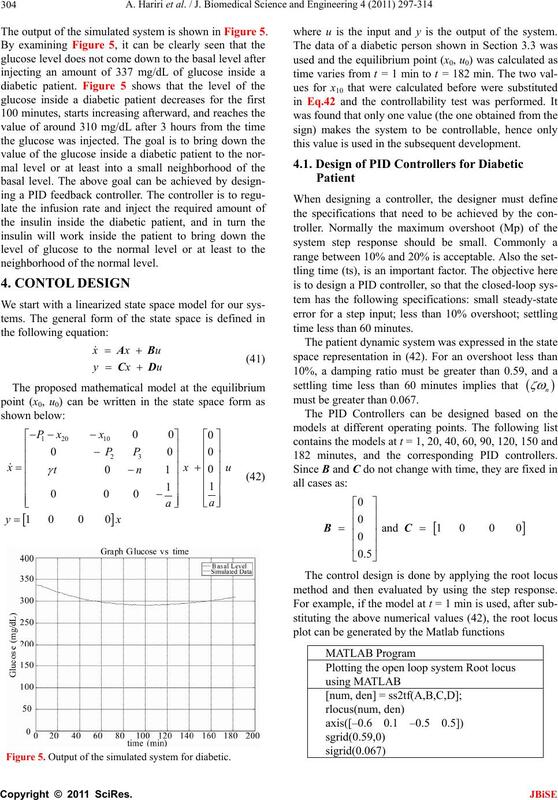 PID Controller for diabetic patient #2.
with chemical diabetes. Diabetes, 23, 674-678.
jects. 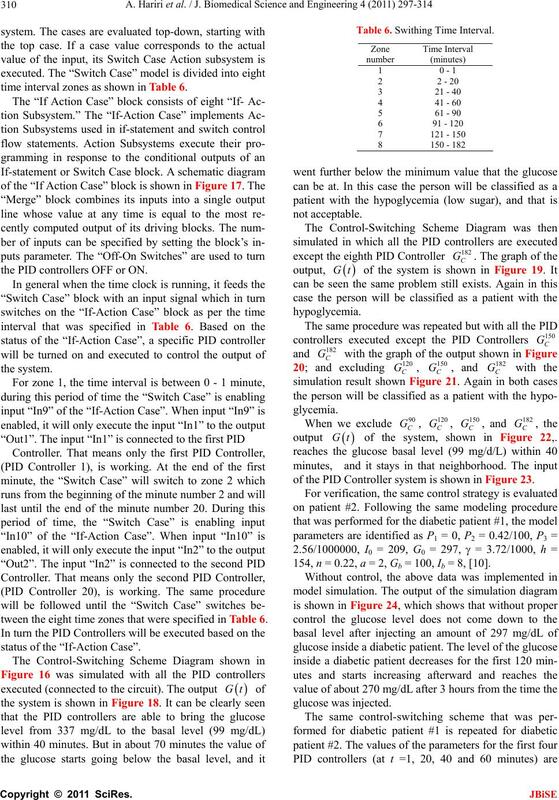 Journal of Clinical Investigation, 51, 1624-1631.
partition analysis, and the estimation of insulin sensitivity. Bergman, R.N., Ider, Y.Z., Bowden, C.R. and Cobelli, C.
can Journal of Physiology, 236, E667-E677. 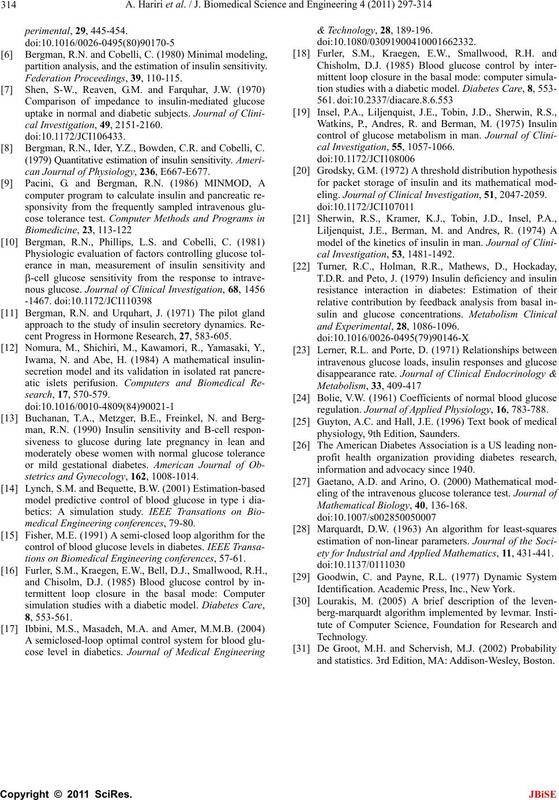 cent Progress in Hormone Research, 27, 583-605.
stetrics and Gynecology, 162, 1008-1014.
tions on Biomedical Engineering conferences, 57-61.
eling. Journal of Clinical Investigation, 51, 2047-2059.
regulation. Journal of Applied Physiology, 16, 783-788.
information and advocacy since 1940.
ety for Industrial and Applied Mathematics, 11, 431-441. Identification. Academic Press, Inc., New York. and statistics. 3rd Edition, MA: Addison-Wesley, Boston.